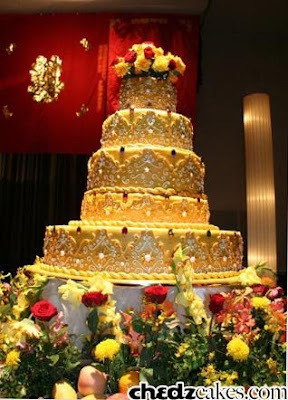 A grand cake to match a very grand event. 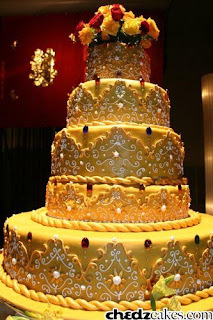 This five layer cake was covered in gold fondant and had very intricate icing embroidery. We added in the crystals for that "royal" look. On top was a topiary of fresh roses. The cake was surrounded by a garden of fresh flowers and fruits for good luck. More happy years for Mr. and Mrs. Tan! Here's the 'thank you' note from Jean (daughter-in-law of the couple): Hi Cecille. Thanks for making the cake. Nice kaayo pagkabuhat. Daghan kaayo nag admire sa cake. (It was nicely done. Everyone admired it.) We highly recommended you to our friends.